Holiday villa Nina is for rent in a quiet villa area in St. Maxime on the Côte d'Azur, only 2,5 km. from the beach and 3 km. from the bustling village centre with shops and restaurants. Lovely modern holiday villa for 8 with 4 bedrooms, 2 bathrooms, heated pool, air conditioning, WiFi internet and amazing view of the bay of St. Tropez! This modern holiday villa is situated in a quiet villa area in St. Maxime, only 2,5 km. from La Nartelle beach. The bustling village centre with restaurants and shops is only 3 km. away. St. Tropez can be easily reached by a regular ferry. Holiday villa Nina comprises a spacious living/dining room and a fully equipped kitchen. The living area opens onto a large semi-covered terrace with dining table and comfortable outdoor furniture. On the ground floor there is a spacious double bedroom with bathroom. The other 3 twin bedrooms are on the first floor. They share a large bathroom with bathtub and shower. The lovely swimming pool is surrounded by a terrace with sun beds. The pool can be heated against a supplement. Breath taking views across the bay of St. Tropez! 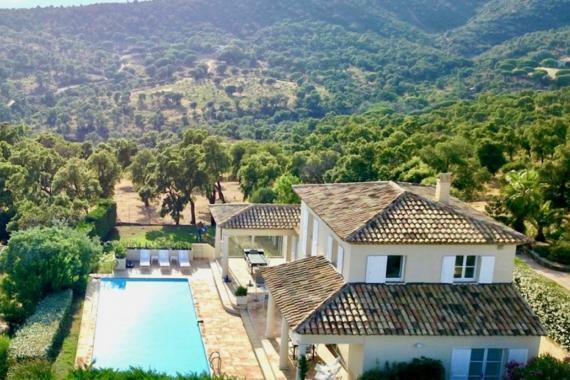 Holiday villa Nina is for rent in St. Maxime on the Côte d'Azur (France). La Nartelle beach: 2,5 km. St. Maxime centre: 3 km. Supermarket: 3 km. Golf course: 1,5 km.Nice airport: 78 km.